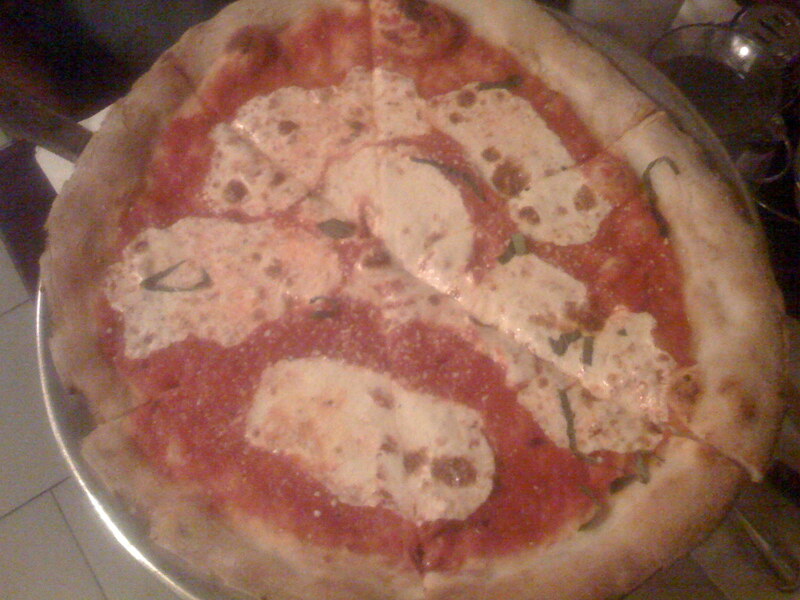 One of my next stops during the pizza journey in New York was at Lombardi's Pizza in Manhattan New York, located on Spring Street. 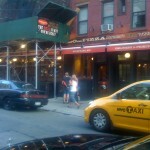 Lombardi's considers itself one of New York City's oldest pizza places. It appears that they have almost doubled in size from my first time eating there, and appears much more cosmopolitan then a pizza place should be. Since I hadn't had this pizza for about 17 years, I was curious if it could live up to its reputation. After waiting about 45 minutes in the heat to get in, we were finally seated in the basement, as if they wanted to keep me out of public viewing. Would hate to be a server at this establishment since you have to walk up and down a steep stairwell to access the downstairs crowd. Since this would be like my umpteeth slice of pizza this day, we got a small plain pie. While waiting for the pizza I came to realize that every person eating there had an accent, from some foreign land. I hope they do not think this is part of the sites to see in New York City! Our food came and it was nice and hot, and although it tasted ok, it was nothing in comparison to Spumoni Gardens, or Di Faras Pizza. The sauce was decent, and had a nice taste to it, and the cheese was quality, but I just didn't think it should be considered one of the best in New York. Maybe it isn't fair to rate Lombardi's Pizza in New York after having such amazing pizza elsewhere around the boroughs. But I know the best pizza when I taste it, and Lombardi's should not be classified as the best. Maybe for a tourist visiting Manhattan for the first time, it would appear it is the best the city has to offer, but just a short distance away from Spring Streeet, there are many other delicious places. Places like Arturo's on Houston. I will give Lombardi's 6 out of 8 slices.